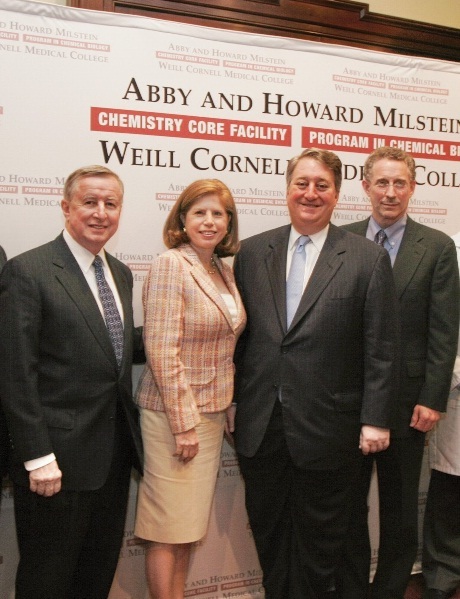 In 2003, the Howard P. Milstein Computational Biomedicine Programmatic Core was established at the Weill Cornell Medical College, where Howard Milstein has served as a Trustee since 1986. As a benefactor in its first and second capital campaigns, he has also chaired its “Cabaret” fundraising gala. Tuberculosis, Malaria and HIV/AIDS are killing millions of people each year. Beyond the human tragedy of these losses is the destabilizing economic and political impact of these deaths in Africa and other parts of the developing world. Disease travels across continents, making this a vital concern — not just for the international community, but for Americans, as well. Bioterrorism is adding a new weapon to the arsenal of those who seek to undermine Western democracies. Antidotes to bacterial weapons are urgently needed. In response to these needs, the Abby and Howard Milstein Chemical Core Facility and the Abby and Howard Milstein Program in Chemical Biology at Weill Cornell Medical College are funding breakthrough research. Under the aegis of Dr. Carl Nathan, a dual antigen cure for antibiotic-resistant infections is underway. The double antigen cure could intercept the normal mutation process that occurs every 500 generations and change that to every trillion generations. In short, the mutations that lead to antibiotic resistance would be slowed to a point where the impact on pharmaceutical treatments would be almost non-existent. This would greatly increase the effective lifespan of new antibiotics developed by Weill Cornell and other research centers. One of the priorities that the Milsteins have built into the research program is the development of new drugs that would be delivered at the lowest possible cost to the needy populations in Africa.